The Atari Jaguar is a video game console that was developed by Atari Corporation in 1993. It was marketed as the first 64-bit gaming system, but was a commercial failure, and is widely regarded as one of the worst systems ever made. 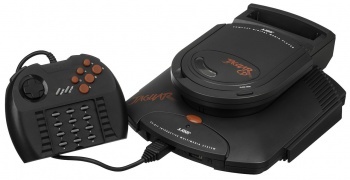 The console later received a CD-ROM peripheral called Atari Jaguar CD, released in 1995. JagView is a tool to find and display uncompressed Jaguar pictures embedded in a ROM file (or separate files). The tool supports 8-bit, RGB and CRY (unique to Jaguar) formats, has a zoom feature and a number of premade settings for specific games. It is similar to Texture Finder and can be potentially usefull for searching through non-Jaguar roms and archives too. JagView is available for Windows at jagware.org. Phoenix is a multi emulation program that can emulate the 3DO, Sega Master System, Colecovision but most importantly; The Jaguar. The compatibility is a little over 95% with only 12 games that aren't fully or don't function at all. The emulator is currently only in Russian and may have extremely bad framerate. This page was last edited on 7 October 2018, at 23:15.